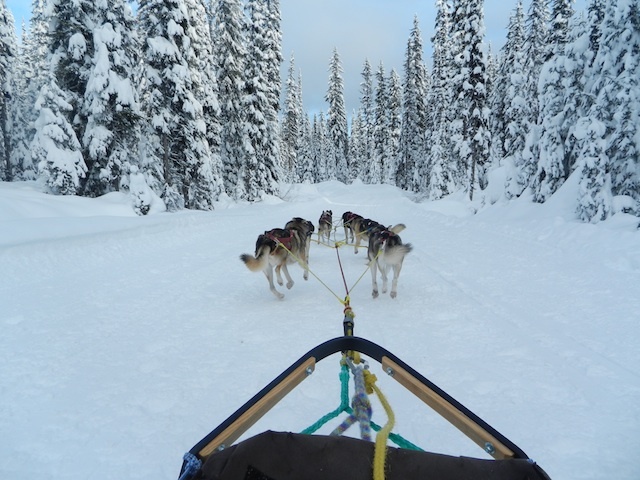 I thoroughly enjoyed every outdoor activity I tried during our family vacation at Big White Ski Resort, but I think flying down a nordic trail pulled by a team of sled dogs was my favorite (don’t tell). I arrived for my Big White dog sledding experience with my mom, a long-time follower of the Iditerod and dog-lover. We met with Tim, Big White’s resident dog musher, and his team of dogs at their kennel situated near the multi-use trails. From the minute we arrived, we were both entranced. Unlike some sled dogs, Tim’s team is friendly and enthusiastic to meet people, so we were able to become acquainted while Tim gave us some background on the dogs (some of which are retired Iditerod athletes), his mission as a musher, and the kinesiology behind what makes a great sled dog. Some dog sledding ventures will simply put you on a sled and take your money, but as soon as we started talking to Tim, it was obvious that he cares as much about educating guests on sled dogs and the sled dog culture as he does about ensuring you have a great ride. After learning what the dogs eat (let’s just say they probably eat better than you and me), where they sleep (in cozy crates nested with straw), and whether they get along with one another (better than my kids), Tim started the process of harnessing them for our sledding trip. As soon as he got the slip of paper out of his pocket on which he’d listed today’s ‘line-up’, the previous calm and quiet kennel erupted in noise rivaling that of a soccer stadium after a goal. “No matter if they just ran, they want to run again,” Tim explained, and my mom and I both noted that this canine characteristic–unbridled enthusiasm–is one of the things that makes us love dogs. With the team finally picked, the dogs on the ‘sideline’ set to wailing and barking while Tim explained to us the process of departing. With a brake set in the snow to prevent the excited dogs from sprinting away immediately (or yesterday, if they had their way), my mom and I settled in the sled and Tim positioned himself on the runners at the back. With one command, the team took off. The first thing I noticed: how fast we were going. The second: how silent the previously barking dogs had become. We could hear a pin drop (or more accurately, only our own shrieks of joy) as we sailed over the packed snow. 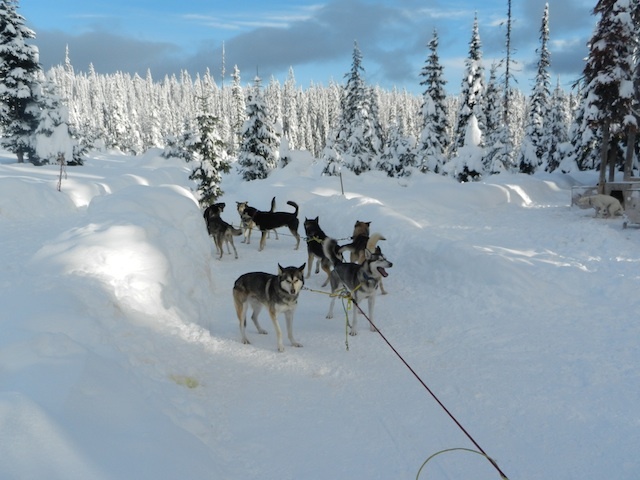 I’d never get tired of watching the dogs run before me (and the beautiful Monashee mountain scenery), but halfway through our 5K (3.2 mile) run, Tim slowed the team and stopped them, offering me a turn at the back of the sled. My mom got her turn ‘behind the wheel’, and before we knew it, we were arriving back at the kennel. Tim showed us how he rewards the team with a tasty frozen meat snack, and we talked more as he unharnessed and praised the dogs. We appreciated how clearly Tim loved his animals, and we came away from the experience with a greater respect for this species, this sport, and the humane people who give it the heart it has. Each sled has a weight limit (rather than a person limit), so depending on your family, you might need 1-2 sleds. (Weight limit is 340 pounds.) Until recently, only one sled could depart at a time, but now Tim’s wife is available most days, allowing entire families to sled together. (For reference, my mom and I, two average-sized adults, could easily fit in one sled.) If you have a larger group, bear in mind that you may need to stagger your start times, though you could all enjoy the dogs at the kennel together. The dog sled experience can be booked nearly any day during the ski season, and reservations can be made ahead of time at the Village Centre Mall Activities Desk and through Central Reservations. Cost is $195 per sled (regardless of number of people). Young kids are welcome, but if some family members would rather not ride, they could come (supervised) with you to visit with the dogs before departure. 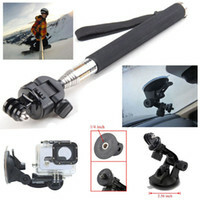 Wear ski gear (snow pants, warm gloves, jacket, and googles). A hat or helmet is also recommended, and you’ll need snow boots. As I disclose whenever applicable, we were hosted for our dog sledding experience. Though we’re grateful for this opportunity to recommend this experience to our readers, it did not come with expectation of a positive review.